1. Choose which resort you would like to stay. 2. Browse through the properties available on that resort and when you see one you like, check the availability. 3. Full prices are available so you should be able to work out how much is payable for your stay. If you need assistance with this, please contact us. 4. E-mail us with your dates, resort and property reference number. Within 24 hours, we will confirm availability and forward you a payment schedule and instructions for making payment. 5. Once booking deposit is received we will send a booking confirmation. 7. On the day of arrival we will meet you at the entrance to the resort and take you to the property where we will give you the keys and show you around. 8. Please feel free to contact us at any time, if you have any questions. We require a deposit of 25% to confirm your reservation. The balance must be paid at least 8 weeks prior to the date of arrival. Payment for the reservation can either be made by bank transfer or by credit card (a 2 % credit card fee will be applied). The moment the reservation deposit has been received, the cancellation fee conditions within, will become valid. Reservation payments are non-refundable. At no time will a deposit be refunded. Notification of less than 8 weeks, 100% of the booking fee is payable. In the event that you change your travel dates, it will be understood as a new booking and subject to the cancellation fees. It is strongly recommended that you purchase trip cancellation insurance. If for any reason we are unable to provide you with the property you have booked, we reserve the right to transfer you to a property of similar characteristics. If we are un-able to re-locate you to a similar property you will be entitled to a full refund. No compensation will be offered or due. On arrival an impression will be taken of your credit card. This is in respect of a damage deposit and will be for the amount of 300â‚¬. This will only be processed, should any damage or missing items be detected after inspection of the property following your departure. If any damage occurs during your stay, this should be reported immediately to (+34) 678094393 or (+34) 690186810 The loss of any key or garage remote control will incur a cost of 70â‚¬ + VAT. On the day of your arrival the property will be available from 4pm. If your arrival is earlier, please let us know and we will try to accommodate you before this time. Please note for arrivals after 9pm there is an extra charge of 20â‚¬. Properties should be vacated by 11 am on the day of departure, unless otherwise agreed with us. On some of our properties, there is a cleaning charge payable locally. Please check this under additional information.The property shall be cleaned prior to the arrival of each client. When leaving, guests are asked to wash dishes, dispose of any rubbish and leave the property in a reasonable condition. Any additional cleaning charge will be taken from the security/damage deposit. The client will inform us of the number and names of guests included within the booking. Unless otherwise agreed by us, only the persons indicated by the client when booking shall be authorised to use the property. The number of persons who may use the property may not exceed the number of persons allocated for each property, except for children under the age of 2 years. Pet are NOT allowed. In the event of any infringement of the aforementioned obligations, the company at its sole discretion will be entitled to request the client to vacate the property and the client shall have no right to claim any type of compensation. The client reserving the property will be liable for the correct and decent behaviour of the persons accompanying him/her. Should that person or any of the persons accompanying him/her not behave in a responsible and suitable way, the company shall be entitled to request the client and the persons accompanying him/her to leave the property without the right for the latter to claim any type of compensation. The company, nor the owner of the property shall be liable for any direct or indirect damages that may arise as a consequence of the use by the client of the property, including without limitation, damages, insurance, losses because of fire, robbery or criminal behaviour. In case of any infringement of the aforementioned obligations, the company at its sole discretion will be entitled to request the client to leave the property and the client shall have no right to claim any type of compensation. We do our utmost to maintain accuracy of properties and facilities offered on our website, however the company cannot be held liable for any errors or omissions that may arise. We also reserve the right to change information published on the website at any time including rates, descriptions and photographs. We make no warranty or representation about the fitness or suitability of any product or service advertised on this website. We reserve the right to update any of our terms and conditions at any time. The onus is placed on all parties using the site to undertake adequate measures to ensure that they visit any such terms and conditions on a regular basis. By agreeing to use this site, it is implied that any such changes are accepted by any such third party and that any such third party undertakes to comply with any such changes. 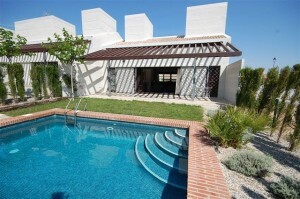 "This is a contemporary designed two bedroom front line villa furnished to a very high standard. It ..."